Even before I ever heard of Bankers without Borders®, I had an interest in microfinance. I am concerned for those who fall "outside the net" and I want to direct my professional skills towards helping them. One of the triggers for my interest in microfinance was a lecture I attended where Muhammad Yunus discussed how he came to create the family of Grameen institutions. My project was for Grameen Foundation’s Progress out of Poverty Index™ (PPI)-- a management and measurement tool they developed. The PPI allows microfinance institutions (MFIs) to better determine their clients’ needs and to measure their progress. My team's project was to develop a survey for 60 - 70 MFIs currently using the PPI to assess how they use the tool. Our research will be completed in the coming weeks. The results will be presented to Grameen and access to the findings given to member MFIs. I created a team of colleagues to develop the survey and to collect the data. The team approach was essential since we needed bi-lingual professionals to translate materials and conduct the interviews. Bankers without Borders has been a great experience for me. It’s a really interesting way to get an inside perspective of Grameen Foundation, and the challenges and approaches of MFIs. It's been a great vehicle to make connections within the microfinance network, complementing my developing interest. Because I spent so much time talking directly with and interviewing MFIs, it really helped me to gain knowledge about the major issues facing practitioners in the microfinance field. Bankers without Borders is a wonderful program for volunteers to develop their professional skills while making an impact. I am convinced of the powerful two-way benefits -- for the volunteers and for the receiving institutions such as the MFIs. Nana Francois has been working in financial services for over seven years. She is a vice president in Equity Research at J.P. Morgan in London. 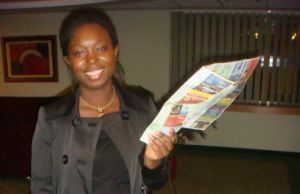 She worked on the PPI Survey for Bankers without Borders from Oct. '09 - Feb. '10. Disclaimer: “The views represented here are solely those of the volunteer and do not necessarily represent the views of Bankers without Borders, Grameen Foundation, our sponsors, the microfinance institutions, or the volunteer’s employer."